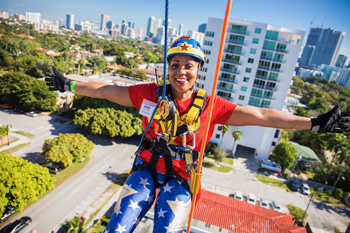 Rappelling down a tall building with Over The Edge (OTE) may be one of the boldest activities you can ask your team to do. Guaranteed, though, the experience will be a memory-making once-in-a-lifetime thrill. What began as a successful, unique one-off fundraiser for three Nova Scotia-based non-profits led its founder to launch the experiential-adventure company. OTE has hosted over 600 events in Canada and the U.S. to date, and recently expanded into Ireland and the U.K. The company continues to organize charitable events in addition to private teambuilding challenges. Combine the two for a headline-grabbing corporate social-responsibility event. Open to all ages and physical capabilities, safety and descent education is priority with every participant receiving training. OTE provides the certified equipment and protective gear, professional rope technicians, the building and insurance. Average rappel time for individuals is 10 minutes with a typical building accommodating six adventurers per hour per rope. Figure on three hours using four ropes for a group of 75. Add GoPro cameras to helmets for post-event instant replay amusement and applause.